Democracy is slow. It seems there may be no solution to the pollution. I borrowed those first two sentences. The first sentence is a summation of a longer quote by history and public policy authors too numerous to list and the second sentence I lifted from a 1979 interview with Reggae Legend Peter Tosh. Seems an odd coupling to quote a one-liner from a Reggae artist next to an observation about government, doesn’t it? But, for public administration, it would be odd not to find ways to communicate policy at its simplest levels. One cannot stress the degree to which governments borrow ideas, suggestions and best practices as it strives toward efficiency. Sometimes a one-liner from a Reggae artist is just what some governments’ need. As public servants, we cannot often predict where the next inspiration will come from. We continue to be surprised by policy outcomes that none of us ever see coming. Sometimes the outcomes are good, sometimes they are not so good. And sometimes democracy is outstanding and sometimes it’s just slow. Going slow is not always bad nor does it always mean we will end up with an unfavorable result. What we know today as corn actually evolved from a teosinte wild grass from the Mexican Central Balsas River Valley that has grown there for thousands and thousands of years. In a new climate, in different soils and using different growing patterns, teosinte became corn, a staple food with an enormous amount of uses. No one knew that that particular grass would one day become corn. Evolution produced a delightful accident that took centuries to make. One can say the same about democracy. The retaining wall at my home collapsed after a rough wind storm. It crumbled to the ground into a heap of concrete. Meanwhile, The Great Wall of China largely still stands. What did the builders of the longest man-made structure on earth know that my wall’s designer did not? Well, for one thing, they understood the value of reinforcement over time. The Great Wall was constructed from the 3rd Century B.C. through the 17th Century A.D. No doubt each century’s builders added the latest technology to preserving the existing wall and in constructing each century’s next few thousand miles of wall. Meanwhile, my home’s retaining wall was probably constructed in two weeks tops. We can learn a lot from China’s Great Wall. We can lift the notion that a project that we would like to see endure for generations may take communication, dedication and sometimes centuries of work. Imagine the depth of commitment that it takes to carry a notion from B.C. to A.D. and to do it in such a way that your efforts have endured well into a future no one could have dreamed about. the spirit of these summer speeches a commitment to build a great wall of support and empathy for the people we pledged to serve. And we must do this, in equal measure, every summer, every fall, every winter and each and every spring. Walls, monuments, statues and bridges can be visually impressive. But walls, monuments, statues and bridges cannot talk. They cannot tell our stories and they cannot debate what’s possible in the future. We will have to do that. Since we’re not inanimate objects shaped by the imagination of a designer or the cuts of a machine, we must speak for the broken-hearted. We must speak out and demand humanity for those who dared to believe the promises offered by the greatest city on a hill. We know what we need to do, we don’t need to call a meeting or hold a series of webinars to talk about the obvious. We need to take off our human-blinders and insist that those who are intent on wearing theirs remove them also. In a previous column, I wrote that legacies are not accidental, nor are they coincidental. We have an opportunity to make use of some of those summer speeches we’ve heard over the years. Today, we can release ourselves, our country and our short-sighted policies from our troublesome wrappings. We can make this future documentary a story with a happier ending. I believe that it was the comedian, Milton Berle, who once said, “I know a good joke when I steal one.” If the walls, monuments, statues or bridges could talk, they would tell us not only should we borrow the best practices for governing citizens and for recognizing the dignity in every human life, but we should steal them if we have to. 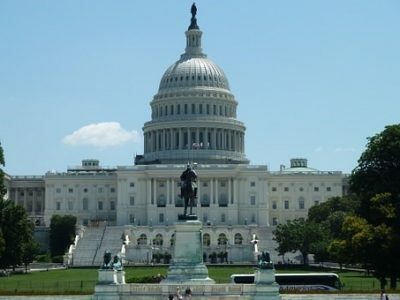 Images: U.S. Capitol image by Pixabay. Photo of Former President Ellen Johnson-Sirleaf taken by Lisa Saye in Atlanta, Georgia. Kelvin, again your notable insights are so welcomed and enlightening. Many thanks for your valuable comments, Oluwatoyin! This master piece has again shown that Public Administration and indeed Democracy are living concepts. The pace may be slow; the ideas may be petty, coming from largely unnoticed segments of the society, but the music of governance plays on. Public Administrator must dance to the tune of the music by ‘speaking’ and ‘talking’ in the interest of humanity. Bravo, Prof. Saye. This seems to be the undergirding premise of modern frameworks, designs, and overall modernization. Mike, thanks so much for your comments. They, as always, are welcomed enlightenment. Thanks for your comments, Marquice. It was a memorable event and speech made by then President Ellen Johnson Sirleaf of Liberia. Wonderful analogy and metaphor, Hassan. Thanks as always for your comments. I think the government in America has become like a soccer game, where every team when they has the ball, they wants to score a goal in the other team. Unfortunately, the ball is the American people. 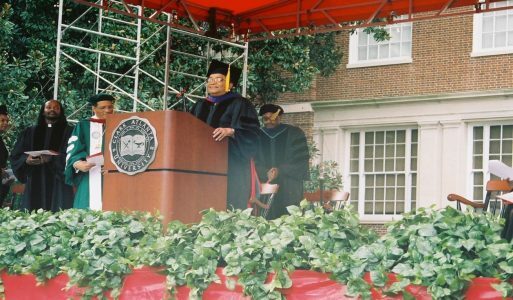 The Clark Atlanta University photo is very powerful. The first elected female head state in Liberia tells that woman can do anything. I applaud and encourage more women to run for office, we need it. Democracy is for all and it should discriminate. Great job! ….Walls, monuments, statues and bridges can be visually impressive. But walls, monuments, statues and bridges cannot talk. They cannot tell our stories and they cannot debate whats possible in the future. We will have to do that. ….as always, this piece is beautiful, brilliant, brave, and breathtaking. The words are poetic, iconic, and breath of fresh air.